PHOEBE PALMER’S HYMN celebrating the sanctifying power of Christ’s blood joined a chorus of American voices seeking to be made clean. Oberlin’s first president, Asa Mahan, and its first theology professor, the famous evangelist Charles Finney, did not hold the traditional Calvinist view of total depravity and predestination. They taught instead that sinners had the “natural” ability to believe, and that evangelistic methods could overcome their “moral” inability through the persuasive power of the Gospel. They understood saving faith as an act of the will that anyone could be expected to make immediately, without waiting for God to give the necessary grace. In the early years of their activities at Oberlin, both Finney and Mahan applied this same understanding to the Christian’s growth toward spiritual maturity—that is, the classical theological topic of sanctification. To be sanctified, they insisted, required only the same kind of simple, instantaneous faith one exercised to be converted. In 1836, both Mahan and Finney experienced “second conversions” that they identified as “baptisms with the Holy Ghost.” Mahan believed that as a result of this experience, his desires and inclinations had been purified, so that he not only was free from committing sin but no longer had a habitual tendency toward sin. Finney found in Mahan’s teaching the solution to a troubling trend in his revivalistic work. Simply put: many of his converts were coming in the front door of revivalistic conversion and promptly “backsliding” out the exit. To the veteran evangelist, a robust doctrine of sanctification offered the assurance that the same grace received through faith that brought forgiveness of sin could bring a stable Christian life free from the habit of sin. At first, Finney and Mahan were cautious about teaching this doctrine publicly. Anything akin to “perfectionism” risked linking them to the aberrant doctrines of John Humphrey Noyes, a Yale theology student who, in 1834, had claimed to be free from all sin. Noyes later founded a utopian community whose members practiced “group marriage” as a mark of unselfishness and a way of ushering in the Kingdom of God. Perfectionism, to 19th-century Americans, had begun to mean “free love,” and a college admitting students of both sexes could not afford the slightest taint of scandal. Therefore, Mahan was seriously alarmed when, during a “meeting for prayer, praise, and inquiry,” a recently graduated theology student put his “beloved instructors” on the spot, asking them publicly, “What degree of sanctification do the Scriptures authorize us to trust Christ for? May we, or may we not, trust Him to save us from all sin, and to sanctify us wholly, and to do it in this present life?” Mahan later recalled thinking in dismay, “They will all rush into perfectionism” (i.e., the teaching of Noyes). In fact, a more reasonable accusation was that these Presbyterians and Congregationalists were teaching a doctrine barely distinguishable from the Methodist understanding of Christian perfection. Indeed, both Mahan and Finney admired Wesley’s writings on the subject, though Mahan was more influenced by Methodism than Finney. Still, both theologians denied that any preparation could come before the moment of faith, either with regard to salvation or sanctification. In both cases, the only thing one can do is believe. For Methodists, on the other hand, conversion and sanctification might involve a prolonged spiritual struggle and a period of waiting for the “witness of the Spirit.” To some Methodists, the Oberlin teaching seemed at once too easy and too dependent on human “natural ability” rather than the Spirit. Similarly, Phoebe Palmer’s influential “Tuesday meetings” were controversial within Methodism because they taught that sanctification could be reached instantaneously by an act of faith that was within human power. Precisely for this reason, however, Palmer began, in the 1830s, to attract a broad constituency of prominent and thoughtful northeastern evangelicals. Methodist bishops rubbed shoulders with non-Methodists like the Congregationalist scholar Thomas Upham, eager to learn the secret of holiness. Upham was the first man to be admitted to the “Tuesday Meetings,” and his encounter with Palmer led him to study mystical experience, attempting to find precursors of holiness teaching in figures such as the Catholic mystic Madame Guyon and the Lutheran Johann Arndt. Thus the holiness movement absorbed and contributed to the ecumenism of the 19th-century revivals—culminating in the “layman’s revival” or “prayer revival” of 1858—which drew together Presbyterians, Congregationalists, Methodists, Baptists, some Lutherans, a few Episcopalians, and even the occasional Unitarian. Holiness teaching offered 19th-century evangelicals a means of overcoming their sectarian conflicts. Doctrine might divide, but the experience of a pure heart would unite all true believers against the threats posed by religious formalism, atheism, and Roman Catholicism. This drive toward unity found expression in the British-based Evangelical Alliance founded in 1846 (although American participation was limited by the Alliance’s strict stance against slavery). In Europe, a series of visits by American evangelists helped the Alliance’s ecumenical cause. Many of these American preachers brought some form of holiness teaching with them. Phoebe Palmer and her husband visited Britain several times, contributing to an evangelical awakening that by one estimate added a million members to British evangelical churches. Another transatlantic visitor was the Presbyterian William Boardman, executive secretary of the Y.M.C.A., author of the 1858 best-seller The Higher Christian Life, and the most successful evangelist of the generation between Finney and D. L. Moody. Two of the most important post-war revivalists in Europe were the American Quaker couple Hannah Whitall Smith and Robert Pearsall Smith. The two Smiths inspired the British Keswick movement, a non-Wesleyan holiness stream that would become highly influential back in America. Hannah was the more theologically astute as well as the more personally stable of the two, and her public appearances were noted for their quiet logic and their lack of the emotional appeals that Victorians associated with “feminine” rhetoric. It was Robert who experienced a “magnetic thrill of heavenly delight” in his 1867 “second blessing” experience, while Hannah’s holiness teaching emphasized the subordinate role of feelings. Robert, it turned out, should have listened to Hannah’s counsel of emotional restraint. On a conference stage in Brighton in 1874, he hinted that the sanctified were free to act in ways that contradicted normal conventions—an opinion uncomfortably close to Noyes’s. These fears seemed to be confirmed when he was discovered kissing a young woman in a hotel room. The matter was hushed up under the euphemism of “poor health,” and the Smiths hurried back to America, their public speaking activity ended except for one brief appearance some years later. The legacy of the Smiths lived on, however, in the English “Keswick” conferences, which began in the 1870s and continue today. Keswick participants—a denominationally mixed but predominantly Anglican group—preferred Boardman’s term “the higher Christian life” to the more radical Wesleyan language of “entire sanctification” or “perfection.” They denied that sinful tendencies could be eradicated (as many American Methodists believed). Instead, they taught that sin was counteracted by the experience of “baptism with the Spirit,” allowing for a joyful and victorious Christian life. While walking through the streets of New York, Moody made a final consecration of himself and his work to God, and felt such an overwhelming sense of God’s nearness that he rushed to a friend’s house and begged for a room where he could lock himself in. He spent several hours alone with God, and as he put it, “I had such an experience of His love that I had to ask Him to stay his hand.” This experience was followed by his first trip to England and the beginning of his international ministry. Moody seems to have interpreted his “Spirit baptism” primarily in terms of power for service rather than freedom from sin, and this interpretation became the hallmark of American Keswick holiness teaching. The growing Bible School movement of the late 19th and early 20th centuries, represented by institutions such as Columbia Bible College and Moody’s own Bible Institute, also popularized the teaching of the higher Christian life. By the end of the 19th century, evangelicals were losing much of their former influence in society and were dividing into fundamentalist and modernist camps. Many were no longer optimistic that the world would be transformed through the preaching of holiness. They saw the world instead, in a favorite image of Moody’s, as a “wrecked vessel.” And they launched themselves outward in a last, herculean attempt to save as many as possible from the floundering ship before she capsized and Christ returned. Spirit baptism, in its new Keswick form as a source of evangelizing power, proved irresistible to these evangelicals. Thousands sought it, from almost every denomination. At the beginning of the 20th century, some “come-outers” arose in the holiness ranks who wanted to recapture the zeal and purity of the apostolic Church. They found this primitive purity obscured by the conventional, middle-class nature of much early 20th-century Christianity, and they concluded that it could only be recaptured by separating from the compromised denominations. From this radical holiness milieu arose the first Pentecostals, believing they had found the mark of the true, pure church. This was the empowering baptism with the Spirit, whose outward sign, they decided, was the apostolic gift of speaking in tongues. Though it had been through some permutations, Pentecostal Spirit baptism was not so different from that taught by Finney, Moody, and the Smiths. Around the middle of the 20th century, Pentecostal-like experience broke out among members of many other Christian churches, eventually including Roman Catholicism. These “charismatics,” with their renewed commitment to a common Christian experience that transcended dogmatic differences, were in many ways the heirs of the revivalistic evangelicals of the 19th century. 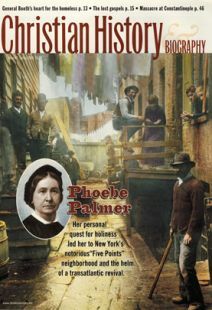 Like the non-Methodist Christians who sat at the feet of Phoebe Palmer and went out to change the face of 19th-century Christendom, modern believers from many traditions have been inspired by the charismatic movement to seek a more intimate knowledge of Christ and a more vivid experience of the Holy Spirit’s power. Today the non-Wesleyan holiness tradition lives on. The Keswick conferences still meet in England, and an American counterpart exists in New Jersey. Many institutions central to evangelical life, such as Moody Bible Institute, Christianity Today, Wheaton College, and Dallas Theological Seminary, have historic links with Keswick or “higher life” evangelicalism, although the distinctive Wesleyan teaching of entire sanctification is hard to find in any of them. Most influentially, several devotional books written by holiness teachers continue to transmit the movement’s teachings to new generations. Hannah Whitall Smith’s The Christian’s Secret of a Happy Life is still widely read today, while her husband’s success and disgrace are equally forgotten except by historians. Streams in the Desert by Lettie Cowman, a holiness missionary to Korea, is another perennial best-seller. The most significant of all is My Utmost for His Highest, the transcript by Gertrude Chambers of a series of lectures given by her husband Oswald. Edwin Woodruff Tait is a doctoral student at Duke University and adjunct professor of history at William Paterson University in Wayne, New Jersey.